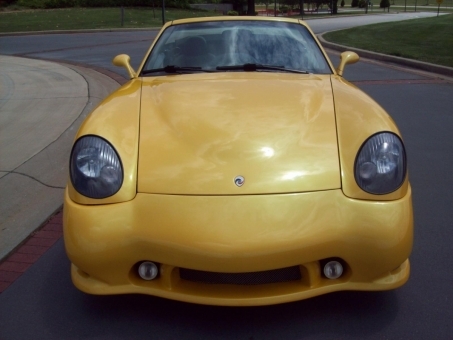 2006 PANOZ ESPERANTE GT 2-PASSENGER 2-DOOR CONVERTIBLE...This vehicle comes powered by a 4.6L V-8 Ford Mustang Cobra Engine along with an Automatic Transmission. Colored in a Lamborghini Yellow Finish over a Black Leather Interior. Other options and features include: A/C, Power Convertible Soft Top, Power Windows, Power Locks, Power Mirrors, Tilt Steering, Cruise Control, Rear Defroster, Keyless Remote Entry w/ Alarm, Alpine Stereo w CD, Dual Airbags, Fog Lights, Dual Power Seats, Dual Lighted Vanity Mirrors, Homelink, Traction Control + ABS, Carbon Fiber Interior Trim, Center Console, Racing Pedals, Rear Spoiler, Magna Flow Exhaust, Brembo Brakes, and 18-inch Factory Alloy Wheels on matching B.F. Goodrich Tires.